Marinating: injects bold flavors and tenderizes the meat. Slicing the meat thin: more delicious marinade enters in, and more contact with the crispening flame. 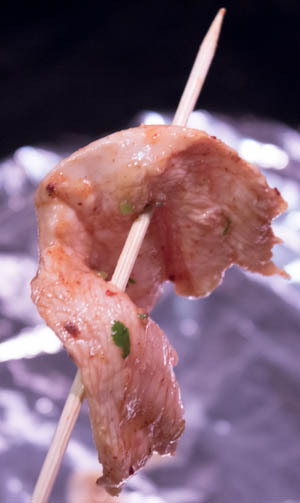 Cooking at high heat: such as grilling will keep the meat tender and juicy on the inside and crispy on the outside. While marinating sounds daunting you should be able to whip this up in less than 5 minutes. Your future self will thank you for making an awesome meal. Spices, by the handful! We don't have no stinkin' weak marinades. Mix the lemon juice, olive oil and all the spices together in a glass dish. Grill pan, or anything grill-like to elevate the chicken off the surface of the pan. Make sure your marinade is mixed and ready to go before you start touching the chicken. Set up everything: knife and board, marinade, trash can and pre-torn paper towels if you’ll need any before you wash up. How you cut the meat is important. More surfaces = more marinade absorbed, i.e. more flavor. If you ever enjoyed a succulent shawarma or gyro then you already knew this. Because of this, I like to cut the meat thinly horizontally, then cut it into shortish strips. 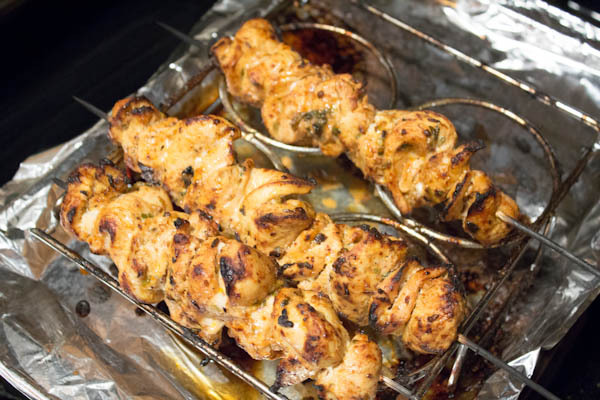 Put the cut chicken breast in your awesome marinade, cover with lid or plastic wrap and refrigerate for 2 to 24 hours. I don't have a grill or even a grill pan. Instead, I've hacked a creme brûlée set up, but with a little creativity, you can use anything grill-like and metal to transform your oven into a barbecue. Otherwise you can just buy a grill pan. Here is my set-up. 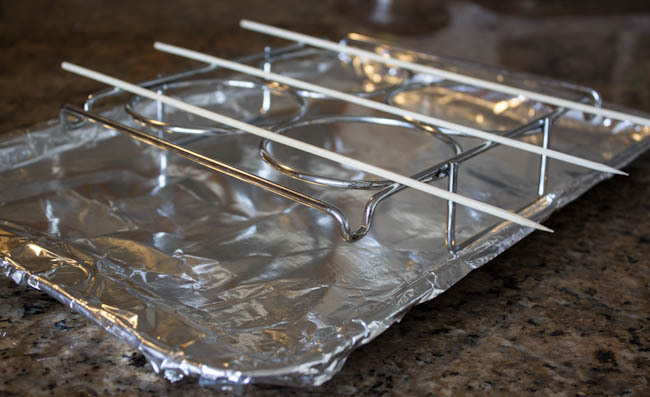 If you have a similar grill device that stands up on its own, just rest it on a foil-covered baking sheet (to catch the drips) and you're ready to go. If you have a flat grill, you can rest it over a foil-covered casserole dish to achieve the same effect of elevating the meat off the foil. 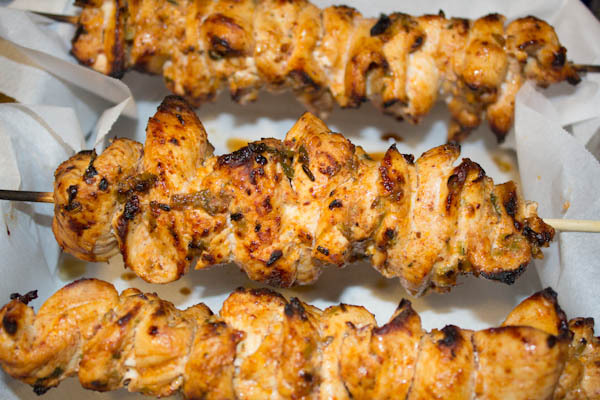 If you want to prevent the skewers from burning, soak them in water for at least 40 minutes beforehand. Then, lay out everything you need: grill-pan set-up, skewers, some torn paper towels for surprise mess-ups. And last before you begin, preheat the gas grill or oven broiler to HI. If threading chicken seems way advanced start with just cutting the chicken in any size chunks, or even buy pre-cut, and roast un-skewered on a foil-covered baking sheet. Cooking lean meat at high heat turns it crispy and locks the juices inside. This also shortens cooking time significantly, so keep a close eye to avoid turning your delicious dinner to charcoal. We recommend broiling, grilling or very high heat baking. Broil on HI for a few minutes per side, checking frequently. As each side develops a crisp, you will turn the meat slightly. Basically, you are using your oven broiler as you would a barbecue. This shouldn't take more than 10 minutes total. If you somehow do not have a broiler, bake at 450F/220C for ~10 min. Mix it all together and use as a light dip or sauce. This chicken goes well with almost anything. 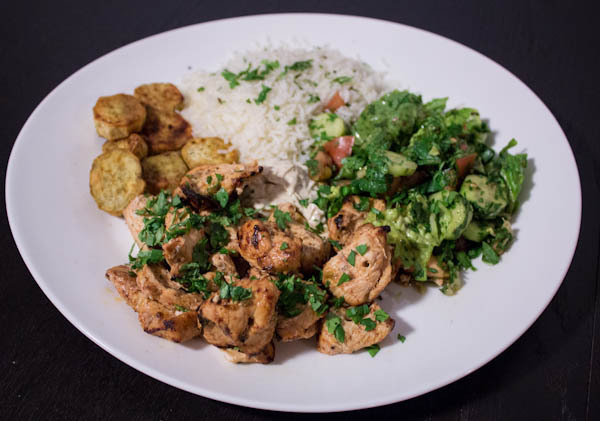 Try it with rice, fresh salad, hummus dip or guacamole. Or you can make a tasty chicken wrap with a corn or regular tortilla. Now that you've learned how to make chicken awesome, don't let me catch you eating bland chicken breast and unseasoned broccoli! There just is no excuse when you can make gourmet quality food quick, cheap and still lose fat. Awesome chicken, rice, sweet potatoes, hummus, and fresh salad. Please share if you liked this recipe!